We are local locksmith company in the Lehigh Valley, PA. Our locksmiths provide home lockout services in Bethlehem, Allentown, and Easton, PA. Being locked out of your home can be very frustrating. Not only you want an emergency residential locksmith, but you probably want fast locksmith service. We provide 24/7 fast, reliable, and professional residential lockout service at extremely competitive rates. If you’ve landed on this page, perhaps you need to unlock the door of your home, right now. With this intention, we’re ready to help, and we’re waiting for your call. As you’re reading this text, we probably on the way to another satisfied customer. Because we provide mobile locksmith services, and always available, our customers know we can be there fast. We unlock any door in need, across the Bethlehem Township area, and beyond. When you call us, especially for emergency house lockout service, you can expect to see our locksmith arriving withing 20 minutes. Yes, this is true, not to mention ten or fifteen minutes, depend when we’re at when you call us. We provide all kind of residential lockout services. In order to help you day or night, our locksmiths available 24 hour a day. It doesn’t matter if you need to unlock the main door of your home or a bedroom. It also doesn’t matter if you need to unlock a shed or garage door, we can unlock any door. 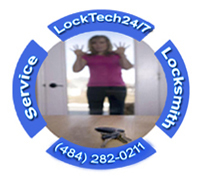 House lockout specialists at LockTech247 can help you in any emergency house locksmith service. It doesn’t matter what type of lock you have on your door. It also don’t matter if you’re locked out of your home because you forgot the key inside, lost the key somewhere, or broke the key. Please call us whenever you need a lockout assistance in your home. Not just we can unlock any door, but we also provide full residential locksmith services in Bethlehem, PA.